The Hotel Quinto Real is located in a privileged setting near the French part of St. James Way. Only 5 kilometers from Zubiri, it is an excellent choice for pilgrims who want to spend the night in a special and charming environment. The hotel has all the amenities to help pilgrims on the way to Santiago. It is a perfect hotel whether you are going to do the complete road, or if you are going to do it by stages. 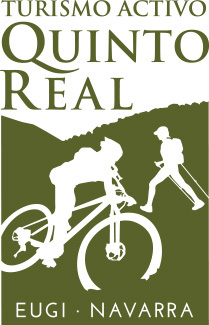 The logistics offered by the Hotel Quinto Real is complete from the guide service in the first three stages from San Juan De Pie de Port to Pamplona, as well as, if not necessary the guide will offer you a transfer service from Eugi to the point of Beginning of each stage in addition to the collection at the end, luggage transport and advice. For the pilgrims, in addition to the hotel and restaurant of traditional Navarrese cuisine, we offer some useful services.